Falafel are great. They’re a wonderful vegan option (I was surprised to learn they don’t even use egg to bind them). They’re super flavorful, have a nice texture and are a great compliment to other delicious foods. I’ve always thought of falafel as being rather fussy and something better ordered out than made at home. However, this recipe is a game changer. Baking falafel not only makes these healthier, it’s also easier than frying. 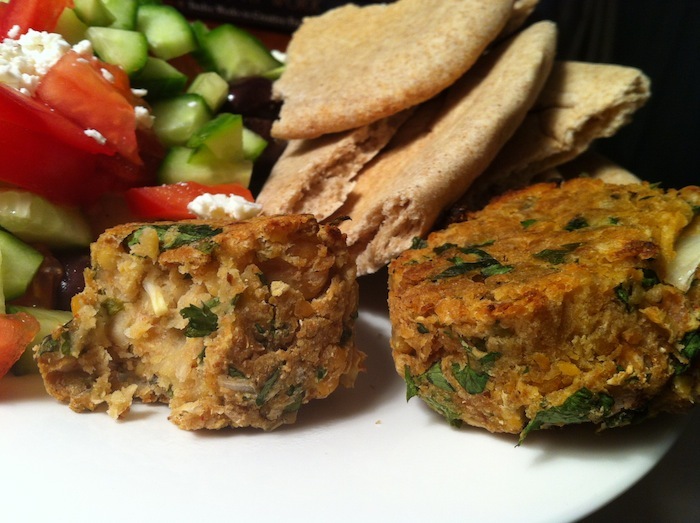 The result, while not as crunchy as traditional falafel, is still wonderfully moist, tasty. If that isn’t enough to convince you, I’ve already made these twice in two days. Once with friends and once (when I doubled the recipe, seen below) for my parents. These are super delicious, and I can’t wait to make them over and over again this summer with a nice big Greek Salad. Preheat oven to 375°F. Generously grease a large baking sheet with cooking spray. In a large food processor, add chickpeas and onion and pulse a few times until minced. Add the remaining ingredients and pulse to mix. If you don’t have a food processor, you can smash the chickpeas with a fork by hand, or use a blender. Mince the other ingredients and add everything to a large bowl and mix by hand until it comes together. Taking about 3 Tbsp of the mix, roll into ball and place on prepared baking sheet. 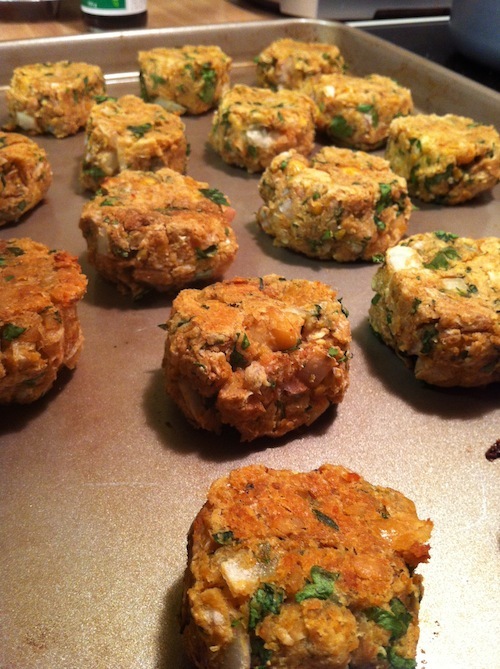 Repeat with remaining mixture and then spray the tops of the falafel with cooking spray. Bake for 20-25 minutes, flipping the falafel halfway through. Thanks for finding the recipe, and encouraging the cooking adventure! Your photos look wonderful. The lighting is so perfect, they look professional! Oooh good ideas! Thanks, Cate!